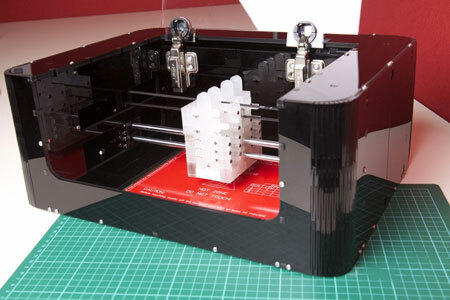 (Nanowerk News) Today electronics 3D printer The EX1 launches on crowd-funding site Kickstarter. Starting from $1,199 on an early bird special, The EX1 is a rapid prototyper that makes printing electronics and circuit boards as quick and as easy as printing a photo. The Cartesian Co. printer EX1 is a desktop device, using inkjet technology to print in elemental silver on a range of different surfaces in the same way an inkjet printer does. It makes printing complex circuits simple and quick, allowing you to create anything from a gamepad remote control to wearable technology in a matter of minutes. Ariel Briner, Co Founder and Head of Electrical Design at Cartesian, explains: "There is a real barrier into the world of complex circuitry, and Cartesian Co. wants to make electronics accessible for the every day person - giving them the power to bring their ideas to life through creativity and experimentation. We've been thinking about how to design a printer that creates circuit boards for four years now and developed the EX1 over the last 9 months, and we hope the Kickstarter community will feel as passionate about the project as we do". The EX1 has two inkjet cartridges and prints onto a base material - the "substrate" - in the same way an average desktop printer would. However, instead of ink the EX1 lays down two chemicals that mix together and produce silver nano particles, leaving a silver image on the substrate. The EX1 can print on both conventional circuit board materials and various types of plastic, glass, wood, ceramic, silicone and even fabric and paper. The ability to print flexible circuits on such a variety of different surfaces means that people can be more creative and experimental with electronics than ever before. Example of a printed circuit board. Isabella Stephens, a Cartesian Co-Founder, explains: "We want to change the way people think about electronics, the same way as 3D printers changed the way we think about making physical objects. Until now making circuits at home has been a frustrating and time-consuming process often involving lots of chemicals, but with the EX1 you have the freedom to instantly test your ideas without the monotony of making a PCB by hand, the time spent wiring it on a breadboard or the days spent waiting to get your design back from a board house". The EX1 has stylish hardware, easy-to-use software and provides an intuitive user experience, so there's nothing holding you back from creating whatever your heart desires - you can even solder the circuits or use conductive glues to join circuits together. While you have control over every printing variable, the EX1 includes tools to make creating electronics an easy process, while at the same time allowing the more experienced pros to push boundaries and experiment. You can back the EX1 on their Kickstarter page now to be delivered early 2014. Cartesian Co. created the EX1 after feeling sick of making PCBs by hand. 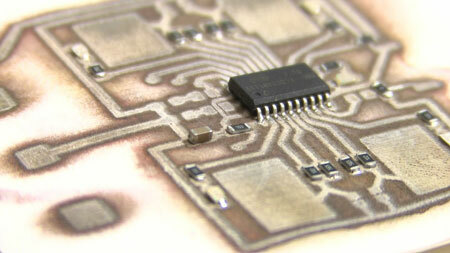 The team set out to find a way to effortlessly make circuits quickly with a minimum amount of user input. After trying all the conventional methods such as milling, iron-on transfers and photo-resist they found all these processes took too long, didn't give good results or were just ill suited. This inspired them to stop trying to replicate others' methods and start inventing.